Allied manpower shortages continued; in October 1944, the 4th Indian Infantry Division had been sent to Greece and the British 4th Infantry Division had followed them in November, with the 139th Brigade of the British 46th Infantry Division. 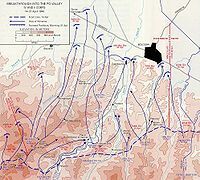 The rest of the division followed in December along with the 3rd Greek Mountain Brigade. In early January 1945 the British 1st Infantry Division was sent to Palestine and at the end of the month the I Canadian Corps and British 5th Infantry Division were ordered to North West Europe, reducing the Eighth Army, now commanded by Lieutenant-General Richard McCreery, to seven divisions. Two other British divisions were to follow them to North-West Europe but Alexander was able to keep them in Italy. Jackson, General W.G.F. ; with Gleave, Group Captain T.P. (2004) [1st. pub. HMSO 1988]. Butler, Sir James (ed.). The Mediterranean and Middle East, Volume VI: Part III - November 1944 to May 1945. History of the Second World War United Kingdom Military Series. Uckfield, UK: Naval & Military Press. ISBN 1-84574-072-6.